Welcome to the Seventh Edition of the Owen Guns Bulletin. Click on the above link and have a look at over 700 firearm photos loaded on the site already. Soon there will be 7000 gun photos and more every day. Just as its Christmas and many of us did not get Mr Rudds Christmas present we decided to give away another case of these excellent, very clear, wide field of view, 4 power scopes at the old price of $40. Treat yourself and put a new scope on your old .22 . You will save on ammo, one shot instead of two is a 50% discount on ammo. (I put that one in for all those of Scots decent.) Merry Christmas and a Happy New Year from all the staff at Owen Guns. Ideal Christmas Present for Dad, An Adult Air Rifle. Practice Target Shooting in the Garage. (Have to be shock resistant for High powered Air Rifles) . These products will all be 20 % dearer as Distributor prices went up 1st December due to dollar. Only until Stocks last due to the stronger US Dollar. Last year we had to pay $600 for one of these. Leupold, the Leading Scope in accuracy and reliability. The new ones we are importing now are 20% more than last months unless the US dollar crashes again prices will be up next month again, so buy now or pay more. These Rimfire rifles produced by Ceska Zbrojovka Uhersky Brod are among the most sought-after firearms in the world. The CZ 452 featuring beechwood stock without checkering, hammer forged barrel with tangent iron sights and simple adjustable trigger. The CZ 452 actions are manufactured from steel billets not tubing or plastic, the barrels are hammer forged for accuracy and long life. The trigger is adjustable for weight, and the safety is located above the rear of the bolt and provides a positive firing pin block. 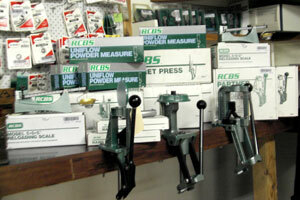 Single shot adapters, 5 round magazines and 10 round magazines are available for this line of rimfire rifles. Can Guns be used for your Defence? Only if your are a Politician. Police officers should be routinely armed if gun crime continues to increase at its current rate, officers’ leaders believe. 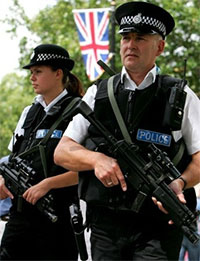 Rank and file police officers have always taken pride in the fact that London is the only major capital in the world where most officers do not carry guns. Jan Berry, the chairman of the Police Federation, which represents 120,000 officers, has now broken with 160 years of that tradition and called for arms to be issued if gun crime continues to increase. Does any one really think the British Bobbies are unarmed? 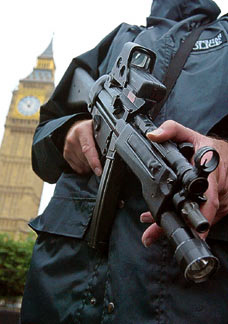 On Thursday, the Home Office revealed that gun crime increased by 35 per cent last year compared to the previous year. There were 9,974 offences in the 12 months to April 2002, compared to 7,362 the year before. The figures came just a week after the brutal murders of two teenage girls in Birmingham. Letisha Shakespeare, 17, and Charlene Ellis, 18, were shot in the early hours of January 2 as a gang war erupted. Are the Guns to protect the Public or Police? Norman Brennan, a serving police constable and chairman of the Protect the Protectors pressure group, also believes the time is coming when police officers will have to be routinely armed. Pc Bob Crees, a former armed response unit officer and secretary of the West Midlands Police Federation, said: “If the police were being targeted by guns then I think the time would come to consider it. Senior officers have always resisted routinely arming the police because they believe that this in turn would encourage more criminals to carry arms. 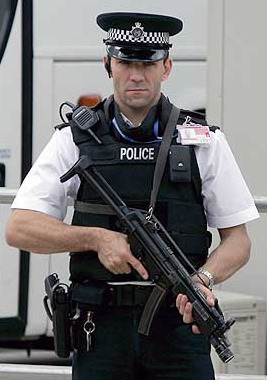 During the year to April 2002, seven police officers were shot in England and Wales. 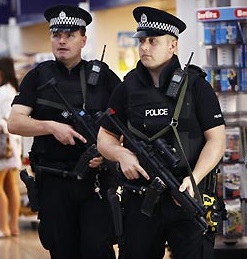 Specialist armed officers patrol in Manchester, Nottingham and London almost every day but most police are still unarmed in those cities. The Government still believes officers should not be routinely armed. Why are Police More Valuable Than Ordinary People? We have to protect our Police and Politicians, but what about the rest? Gun Manufacturer and Target Shooter. The name of “Rigby” synonymous with firearms was founded in Dublin, Ireland, in 1735, since then John Rigby & Co. has forged an enduring history of manufacturing excellence and design innovation that is unequalled in the annals of rifle and shotgun manufacturing. In the eighteenth and nineteenth centuries, the company built duelling pistols and defensive weapons, such as the blunderbuss, which established its reputation for utter reliability in life-and-death situations. Later, and continuing to this day, the company’s mainstay has been the manufacture of the world’s finest firearms for dangerous game and other large animal hunting. The company traded as W. & J. Rigby during the period 1820 – 1865 during the flintlock and percussion eras. A London shop was eventually opened in 1865, and the Dublin premises finally closed in 1897. 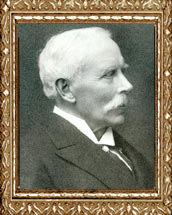 Around 1880, John Rigby became Superintendent of the government Royal Small Arms Factory at Enfield Lock, and was in charge of development of the British service issue .303 British calibre rifle. He was a distinguished rifleman who had competed at international level with the Irish team, and this brought the Rigby’s name to the fore in rifle making. The principles of this Target Shooting was made possible by Mr Joseph Whitworth in the 1850’s, all famous Gunmakers competed and developed a special class of ‘small-bore’ target rifle. The majority of these rifles were around .451 calibre, and the term ‘small-bore’ was used to distinguish them from the ‘large-bore’ service rifle of .577 calibre. Trials were held at Hythe in May 1860 to select a suitable rifle. Mr. Whitworth and a deputation of Birmingham gun makers contested the trials, with the Whitworth rifle being the clear winner. 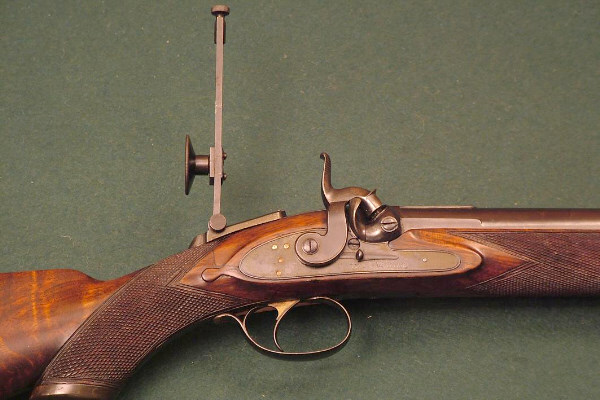 With one exception, the Whitworth rifle continued to be issued to Queen’s Prize finalists until 1871, when for the first time the match was shot throughout with breech-loaders. The exception in 1865 was the Rigby target rifle. This very notable exception was in 1865, when the Rigby rifle was issued to Queen’s Prize finalists. A report of its selection, which follows, was published in The Times of Monday, 29 May 1865. MR. RIGBY’S RIFLES – In the competition last year which went on between Mr. Whitworth’s and Mr. Rigby’s rifles the Council of the National Rifle Association reserved to themselves the right of instituting further trials of both weapons, which as far as the contest went, had shot in an almost equal figure if merit. To these further trials, however, which were ordered by the Association Mr. Whitworth declined to accede, and Mr. Rigby’s rifles were accordingly chosen by the Association as the weapons with which the second stage of the Queen’s prize should be shot, instead, as here to fore, with the rifle of Mr. Whitworth. To test the weapons thus supplied by Mr. Rigby, of Dublin, a special trial has just been made by the Council of the Association at the 1,000 yards range of the Royal Factory at Enfield. A number of rifles were supplied which were examined by Lieutenant-Colonel Dixon. The bores were gauged for diameter, the lock and other parts tested, the rifle weighed, and a lead pattern of its interior, and the pitch of its rifling ascertained. All proving perfectly correct, 15 were selected for trial at the targets. In the firing no mechanical loading rod was used, nor, it is stated in the official report to the National Rifle Association, was such assistance necessary, as there was no fouling or any difficulty experienced in sending the bullet home from first to last; and the report further adds that the Council “may safely congratulate themselves upon the excellent arm which has been selected by them for the year for the 60 best shots at Wimbledon.” In all, 15 rifles were tried and 83 shots, at 1000 yards; all, of course, from a mechanical rest of Mr. Rigby’s own make. The mean total deviation of all the shots fired was as low as 1.57. In some cases it was as low as 1.11, and the greatest deviation was only 2.15. Mr. Rigby had made the acceptance of his rifle by the Council depend upon its making an average figure of merit at least equal to the figure of merit made by Mr. Whitworth’s rifles at 1,000 yards in the trials of 1862, 1863 and 1864. In 1862 Mr. Whitworth’s mean deviation was 2.35, in 1863 it was 1.77, and last year it was as low as 1.83, the mean of the three trials therefore being 1.98. As Mr. Rigby’s mean for this year is the lowest ratio of deviation that has ever been attained by any rifle at 1,000 yards, and well within the figure of merit allowed by Mr. Whitworth, it follows that up to the present Mr. Rigby has gained the best of the contest, and produced a rifle which has as yet shot more truly than any other known in this country, at least. Rigby rifle shows the long range aperture sight. Many of the world’s most-famous hunters and adventurers have relied on Rigby rifles. The renowned tiger hunter Jim Corbett carried a .275 Rigby; Kermit Roosevelt, (son of Teddy), shot a .450 Nitro Express Rigby double rifle during their 1909 African safari; legendary elephant hunter Walter Dalrymple Maitland Bell used a .275 Rigby; and the famed African safari guide Harry Selby had a .416 Rigby as his favourite lion rifle. Rigby landmarks include the 1897 introduction of the .450 calibre Nitro Express Double Rifle; the 1899 production of the Rigby .275 calibre (7×57 Mauser) Mauser system and the Rigby .350 calibre Express Rifle; and the 1900 introduction of the .350 Mauser System. 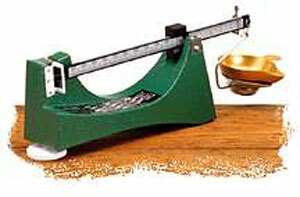 In addition to earning a reputation for unsurpassed quality of workmanship, the Rigby company also established a track record of innovation that allowed it to survive through changing times. The introduction of the .450 Nitro Express in 1898 rewrote the book on big-bore rifle design, and Rigby was among the first of the English gunmakers to recognize the potential of adapting the Mauser ’98 bolt-action magazine design for hunting purposes. In 1907 the Rigby .470 became Rigby’s main big game double rifle, and in 1912 the .416 Rigby calibre magazine rifle was introduced. Between 1900 and 1960, the Rigby Mauser System was predominantly made in calibres .275, .350 and .416 Rigby, with some .303 calibre rifles in the early days. After that period a wider range of calibres were manufactured. Rigby also made boxlock and sidelock shotguns throughout this entire period. Armalites’s AR 180 Operation & Maintenance Manual, plus Numbered Parts Lists and Exploded Views.